Alyse Gregory (1882–1967) was born at Norwalk in Connecticut. One of her first great loves was music and she spent some of her early years in Europe training to be a singer, but on returning to the United States became involved in local politics and the woman’s suffrage movement, for which she was a fearless public speaker. In New York she began contributing articles to such publications as The Freeman, The New Republic and The Dial, becoming editor of this last journal in 1924. That same year she married the English writer Llewelyn Powys and moved with him to Dorset in 1925. Over the next six years she published three novels – She Shall Have Music (1926), King Log and Lady Lea (1929) and Hester Craddock (1931). These were followed by her only other published volumes – a collection of essays, Wheels on Gravel (1938), and an autobiography, The Day Is Gone (1948). After Powys’s death in Switzerland in 1939, Gregory continued to live in the same house near East Chaldon with his sisters Gertrude and Philippa Powys. A sensitive and private person, she was a friend of many eminent writers of the day, including Theodore Dreiser, Edna St. Vincent Millay, Marianne Moore and Sylvia Townsend Warner, but tended to remain in the shadow of her husband, whose work and reputation she did much to promote, while continuing to contribute her own articles to a variety of journals up until the late 1950s. In 1957 she moved to Devon where she died ten years later. Excerpts from her diaries were published in 1973 under the title The Cry of a Gull. The Sundial Press has reissued Hester Craddock (2008), King Log and Lady Lea (2010) and She Shall Have Music (2017). Also available Alyse Gregory: A Woman at Her Window by Jacqueline Peltier. A fifty-two page monograph, including ten illustrations, (ISBN 1897967624) published by Cecil Woolf. Why, at age forty, did she marry Llewelyn Powys, when she had spent all her adult years distaining the institution of marriage? As the first woman to be managing editor of The Dial, the pre-eminent literary magazine of the twentieth century, why did Gregory resign from a position she clearly loved to retreat to the desolate English coast? Why did Gregory, an ardent feminist, never stand up for herself in her marriage? Why did she remain with Powys despite his countless infidelities and treacheries including psychologically torturing Gregory with tales of his longings for his lover and their attempts to have a child? The definitive answers to these questions may always remain a mystery because like Sylvia, the protagonist, of She Shall Have Music, Gregory determined early in her life, to keep her true self hidden. This was a way of shielding her hypersensitive soul and honouring solitary study and contemplation, which she valued above all else. 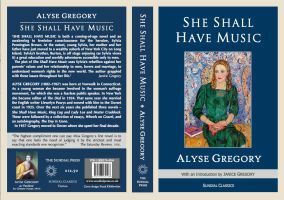 Nevertheless, She Shall Have Music provides insights into Gregory’s choices. The book draws from Gregory’s real life, gives her a platform for examining her feminist beliefs and, strangely enough, foreshadows the consequences of her choices. The novel is both a coming of age story and an awakening to feminine consciousness for the heroine, Sylvia Pennington Brown. At the outset, young Sylvia, her mother and her father have just moved to a wealthy suburb of New York City on Long Island. Sylvia’s brother, Burton, is off stage enjoying (as Sylvia views it) a great education and worldly adventures accessible only to men. Mrs. Pennington Brown, the quintessential social climber, frets over Sylvia’s bookishness, and schemes to introduce her daughter to society and to marry her to a man from the upper classes. She is aided in her schemes by the sycophantic butler, Meadows. Her husband, Mr. Pennington Brown, escapes to his job as a banker in New York City. While he minimally supports his wife’s endeavours, he appears more as a pawn in the action. Sylvia, of course, falls in love with a boy from the wrong side of the tracks, the drunken gardener’s son, Marcel, from the neighbouring estate. Despite his low birth Marcel is an intellectual living in a study filled with books. Sylvia and he are simpatico souls seeking knowledge and an understanding of their unfolding world – a world set in the early twentieth century when new inventions, such as the car, electric lighting and the airplane, abounded and the social structure was upended by the consequences of World War I, emerging working class rights, and feminism. The plot of She Shall Have Music uses Sylvia’s rebellion against her parents’ values and her relationship to men, lovers and marriage, to understand women’s rights in the new world. Gregory grappled with these issues all her life. Alyse Gregory (1884-1967) is one of the many as yet unrecognized American women modernists of the early twentieth century who unfortunately suppressed her ambitions in order to fulfill the role of the ideal wife according to the precepts of nineteenth century “true womanhood.” Her second novel, King Log and Lady Lea (1929) candidly discusses the options available to women at the time. It opens with a marital breakfast scene which introduces the reader to Mary and Richard Holland. Mary, who recognizes that after two years of marriage “her experience had closed in about her and was contained only in the figure of her husband” [p.4], likens herself to a “wounded gull shot while flying over a swamp”  – the same bird that years later would lend its name to the title of Gregory’s diary. In spite of this self-knowledge, willing to forsake her writing, betray her well-developed artistic tastes, and sacrifice her peace of mind, Mary throws all her intellectual and vital energy into ensuring her husband’s well-being. In order to afford him some distraction from the quiet life of the country, she invites Celia, a young woman he had known before his marriage, to spend a few days with them. The amorous triangle that ensues and the final tragic death are narrated by Gregory with psychological insight and poetical intensity. Gregory had made her position as to modernist experimentation clear in her reviews for the Dial, of which she had been Managing Editor till her marriage to Llewelyn Powys. She wanted language to be “simple and selective,” capable of expressing a clear thought, and she objected, for example, to what she saw as a lack of “dignity, simplicity, and restraint” in H. D.’s prose . King Log and Lady Lea does not always achieve the simplicity and restraint that Gregory sought, veering, at times, dangerously close to melodramatic sentimentality, but the invisible narrative voice, strictly channeled through the consciousness of the characters, is distanced and controlled in spite of the torments of agitation that Mary, Richard or Celia occasionally surrender to. Gregory is sufficiently in command of the narrative to allow for subtle moments of comical insight, such as when Celia praises Mary’s playing the piano, and Richard, who had never considered his wife in any way talented, is surprised – and feels “his own importance enhanced in consequence” . New York, where part of the novel takes place, and the countryside are also portrayed as experienced by the characters: for example, we are not told that Richard ran up the steps as he pursues Celia toward the end of the novel, but that “The tracks above as he took the last step up the curb seemed to descend upon his head, the pavement to rise up like a perpendicular plane” : thus the city participates in the human drama that unfolds on its streets. Similarly, in one of the many scenes in the country, nature is made into an active element in the minimal plot: “When would the first yellow irises come, and the pickerel weed, they [Mary and Celia] wondered, hoping that both would be together to view them, for each drew away with fear from the thought of separation” . As Anthony Head in his sensitive introduction to the Sundial edition of this novel states, there is “an undeniably personal nature” in the events that Gregory recounts in King Log and Lady Lea. However, the novel cannot be considered a model for Llewelyn Powys’s Love and Death: an Imaginary Autobiography (1939); Gregory’s novel is not a Proustian reclaiming of “the significance of past life through creative reordering,” which is how Peter Foss presents Powys’s novel . Rather, Gregory is attempting to exorcize – and imaginatively compensate for – a very recent past and its impending reiteration. The novel can be read as an attempt to come to terms with the anguish that her husband’s infidelities caused her but also as an attempt to justify her tolerance of Powys’s insensitive behavior – and to imaginatively explore the possible results of a woman leaving her husband. Although it is generally assumed that the novel is based on Llewelyn Powys’s relationship with Gamel Woolsey, Gregory’s letters home reveal that she was already busy rewriting her first draft in September 1927 – and feeling fairly optimistic that it would be much more successful than She Shall Have Music, her first novel . The direct inspiration for King Log and Lady Lea would have been Powys’s affair with Betty Marsh, a young woman he had known before he married Alyse Gregory; Powys did not meet Woolsey until after their return to Patchin Place in November 1927. In an undated letter to Malcolm Elwin, Gregory explains how, soon after her marriage to Powys, she had agreed to Betty’s visit, thus establishing a precedent for the later relationship with Woolsey. She had always valued her independence and solitude and by giving her husband the liberty he sought gained a certain measure of freedom for herself – a license she would never take advantage of. Although in King Log and Lady Lea she examines the consequences of conjugal freedom, the novel is more fictional than autobiographical. If, as Jacqueline Peltier in A Woman at her Window rightly points out, descriptions of Celia coincide with the descriptions of Gamel Woolsey in The Cry of a Gull, this is because Gregory would continue rewriting her novel till it was published at the end of 1929, incorporating characteristics of the woman who was indeed to become one of her closest friends. The question of a lesbian relationship is inevitably raised by King Log and Lady Lea; Rosemary Manning remarked on this possibility, but dismissed it, saying “That her [Mary’s] relationship with Celia is lesbian is hinted at, but is unimportant. The story’s power is in the alliance of these two women against the man they both love” . I agree with Manning that this is not a significant issue in the novel, which is much more than an examination of female friendship. The themes of the novel focus on fear of the natural processes of life: ageing – particularly for women – and death; on the total solitude of human beings that is never fully assuaged even by the beauty and variety of nature; and on the impossibility of real communication and interpenetration with others – achieved in nature but rarely by humans. It is also about the sexual life-force of women that post-Victorian society strove to deny, and the lack of understanding between human beings and particularly men and women. Gregory does not focus exclusively on how female friendship empowers women in her attempt to understand human behavior; her capacity for psychological insight and her admiration for Freud’s theories does not allow for a simple resolution to the human triangle created by Richard. Mary does not want to hurt her husband by leaving him suddenly; although she recognizes that her life had folded in on itself after marriage and that she had lost – and misses – the independence of mind and action that she had previously enjoyed, on some level, she still loves Richard and pities him. Celia’s allegiances, however, have turned exclusively to Mary and, through Celia, Gregory captures the fears, insecurities, and jealousies that plague all relationships. Pity and jealousy lead to a series of fraught, almost melodramatic scenes that culminate in a tragic street accident. Mary’s sense of obligation to Richard, and her inability to fully confide in Celia because she sees her as thirteen years younger and so a rival on the sexual arena come close to destroying the women’s friendship. And yet Gregory ends the novel on an optimistic note; a tune spiritedly played by an Italian band offers Mary a promise of fullness of life, and – we hope – a renewal of the bonds of friendship. Lady Lea – sometimes spelt Lee – has been variously identified, but could be Lady Margaret Wyatt, a childhood friend of Anne Boleyn who accompanied the doomed queen as she awaited her fate in the tower. In that case, and Gregory’s erudition was far-reaching, the reference could be to the loyalty of women’s friendships. The other quotation, the first four lines of Shakespeare’s Sonnet 41, “Those pretty wrongs that liberty commits” seems to exonerate infidelity as a trifling misdemeanor. Although the betrayal in King Log and Lady Lea is committed by Richard, it is Mary who, true to social prejudices, feels guilty. She takes responsibility for having invited Celia, for being older and therefore of less interest to Richard, for enjoying her newly-found female friendship with Celia, for being angry at Richard’s callous behavior. At no point does her husband even entertain the thought that he has done wrong; he is incapable of seeing the events from her point of view or of understanding how he has hurt and offended both her and Celia – nonetheless, Gregory, by her sensitive portrayal of Richard’s tormented mind, makes him into an amiable character whose predicament rouses the reader’s compassion. Mary’s obligation was to construct and safeguard his faith in his virility and in his social and artistic talents; the moment she strays from this path, his sense of identity is shattered: he finally sees himself as “a figure puerile and insignificant. . . . To whom could he cling? Who was there to comfort him? . . . He was a Philistine, a failure” ). King Log and Lady Lea rehearses imaginatively the opinions on marriage that Gregory expressed in her diaries and, more publicly, in articles published in literary journals in the early twenties and in Wheels on Gravel, a collection of essays that came out in 1938. “The Dilemma of Marriage,” an article in the New Republic on 4 July 1923, is a radical statement against monogamous marriage and the unequal treatment of women in a nation that had just recently, in 1920, given women the right to vote. Gregory, who had fought for suffrage, and who by this time was living with Powys, but not yet married to him, audaciously affirms that “It is hardly an exaggeration to say that most monogamous marriages are compromises based upon mutual illusion, and maintained by fear” ) – and fear is one of the essential components of all the relationships in King Log and Lady Lea. By 1938, when she published Wheels on Gravel, which includes an essay of the same title, her views had been tempered by her experiences with Powys and by time itself, although she continued to believe in the polygamous nature of humankind and in the positive aspects of polygamy. To add weight to her argument she turned to Nietzsche, whose Dionysian joy of life she struggled to make her own, a joy she projects onto Mary: “Life means for us constantly to transform into light and flame all that we are or meet with”. However, Gregory – as is Mary – is fully aware of the tension created by the need for tenderness and security as opposed to this need to live adventurously. She insists that a woman who loses the love of her husband/companion to another woman should not feel belittled, for such a loss bears no “stigma of dishonour” , and the suffering caused by feeling “her own worth annulled” and seeing herself “shorn of every charm”  can be combated by “intelligence – intelligence and more intelligence” . And yet, as she had written in Wheels on Gravel, “Women create the illusions in which men thrive and themselves perish in the illusions they create” . In her earlier, imaginative, recreation of the theme, the women do not perish: Richard’s obvious infidelity stirs Mary to reflect on how and why she has transformed herself from the independent, fearless woman she had been before her marriage, to virtual non-existence: “she had nearly vanished altogether”  as she says of herself. But at a critical moment in their relationship, Mary reflects that “If he no longer loved her she had nothing to lose in being herself” . The carefully prepared and designed Sundial edition of King Log and Lady Lea makes this novel by Alyse Gregory available after many years to the general public, and together with Hester Craddock, her third novel, published by Sundial Press in 2007, should do much to affirm Gregory’s position as a modernist writer of stature. King Log and Lady Lea, a study of infidelity and the struggle to overcome fear of solitude, is still valid today and probably more likely to attract readers than the later novel. Alyse Gregory. “A Poet’s Novel.” The Dial, November 1927, 417-19. Gregory’s letters to her mother are held in the Beinecke Library of the University of Yale. Rosemary Manning. “Alyse Gregory: A Biographical Sketch based on her Published and Private writings.” Powys Review. No. 3, 1978, 90. Alyse Gregory. Wheels on Gravel. London: John Lane The Bodley Head, 1938, 73. As Hester and Edwin, in the last pages of Hester Craddock, ‘approached the Black Nore promontory where the sun was flinging its powerful rays onto the abrupt bitten edges of the white dazzling cliffs’, their own troubles　are reflected in the stark solitude of the terrain and the melancholy mewing of the gulls. Alyse Gregory, author of this novel that was published in 1931, also identified with the cliffs and the downs where she had made her home in 1925, and where she would remain – with brief absences – until 1957. Gregory had moved to Dorset from New York where she had been Managing Editor of The Dial; she was also an established essayist and book reviewer, a largely self-educated, responsive and intelligent woman who had decided to give up her independence and career for love. Born on 19 July 1884 into a well-established family in Norwalk, Connecticut, she had always felt herself to be the outsider, the unwanted child that could never live up to her parents’ expectations. Unable to face failure and yet terrified of boredom, her extreme awareness and sensitivity made those early years into a time ‘to be endured’ rather than ‘enjoyed’, and allowed her to build up the ‘granite strength of character and courage’ that would see her through life and, eventually, suicide, on 27 August, 1967. At the turn of the century, the moral strictures of the Victorian era were giving way to the demands of evolution, technological pro�gress, and women’s rights; in some ways, Gregory benefited from this move toward what we can, today, call a modernist liberalization of thought and mores. She spent some years in Italy and France, studying music – she had an excellent singing voice – but, unwilling to trust her voice in public, she returned to Connecticut after a few years to, as she would set down in her autobiography The Day Is Gone (1948), ‘pursue ends concealed from others’. An idealistic inter�est in town politics and education, a deep, active commitment to the woman suffrage movement, writing, and editorial jobs in New York filled the next years. She soon made a place for herself in literary and intellectual circles, counting Scofield Thayer, Harold Stearns and Randolph Bourne among her closest friends. In early 1924 she accepted the position of Managing Editor of The Dial, a prestigious post she would hand over to the poet Marianne Moore in July 1925 in order to accompany her husband to England. Gregory violated her deepest convictions when she succumbed to Llewelyn Powys’s marriage proposal in 1925, or perhaps she sim�ply gave in to her need for affection. The words she wrote in her diary – excerpts from which were later published as The Cry of a Gull (1973) – express her misgivings: ‘Yesterday was my wedding day. It is what Llewelyn wanted, but some cloud lies upon my spirit as if I had betrayed something in myself.’ Whatever her motives, marriage transformed Gregory: the independent, professional working woman who spurned all domestic tasks suddenly became wife, mother, and nurse to a man who was consumed by ill health and who shared her literary aspirations. Once in England, they moved into a small coastguard cottage – which boasted neither plumbing nor adequate heating – on the White Nose, one of the highest cliffs of the Dorset coast. They were deep in Powys territory, close to Beth-Car in East Chaldon, where Llewelyn’s brother Theodore had made his home, and to his sisters, Philippa (Katie) and Gertrude at Chydyok. Isolated, windswept, and quite beautiful, the downs and beaches became the setting for a turbulent period in Gregory’s life and also the setting for her third novel. In 1929, the circle was extended to admit Gamel Woolsey, an American poet with whom Llewelyn Powys had fallen in love.